The project analyses and maps potentially avoidable network investment and locations where CSP can address network constraints. This project investigated whether network support payments for installing Concentrating solar thermal power (CSP) at grid constrained locations in the Australian National Electricity Market (NEM) could bridge the cost gap for CSP, while achieving societal savings in the costs of addressing network constraints. The project quantifies the potential economic benefits from installing CSP at grid constrained locations, and maps where CSP could provide cost-effective network support services. The project found that CSP can offer a commercially viable alternative to traditional network augmentation solutions in addressing electricity grid constraints. 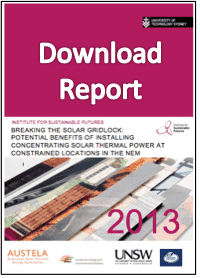 The study identified $0.8 billion of potentially avoidable network investment, and 533 MW of cost effective CSP which could be installed at grid constrained locations in the next 10 years. This would reduce greenhouse emissions by 1.9 million tonnes per year. The project was undertaken with funding from the Australian Renewable Energy Agency, electricity network services provider Ergon Energy and the Australian Solar Thermal Energy Association (AUSTELA). 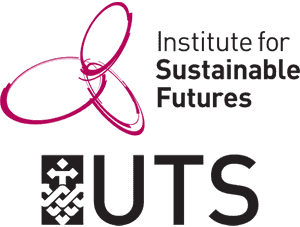 The project was led by the Institute for Sustainable Futures at the University of Technology, Sydney with the Centre for Energy and Environmental Markets at the University of New South Wales and AUSTELA. Assistance and advice was provided by IT Power. Network partners Ergon Energy in Queensland, Essential Energy and Transgrid in NSW, ElectraNet and SA Power Networks in South Australia, and SP AusNet and Powercor in Victoria, all collaborated on the project and assisted with data provision.